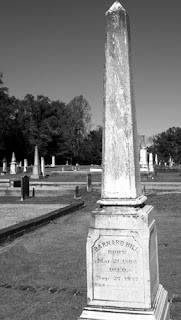 -- A special to the Telegraph-Messenger dated Fort Valley, 27th, and signed by T. J. Simmons, W. S. Wallace and A. S. Miller, says 'Judge Barnard Hill died in the court room at Knoxville, at half-past six o'clock this afternoon, of apoplexy.' He was quite an old man and was appointed to the bench of the Superior Court by Gov. Smith. He formerly resided in Talbotton, and has, until appointed Judge, been a frequent attendant on the courts in Columbus. He was specially noted as a superior equity lawyer. His health has been delicate for a long period. The remains will be buried in Talbotton, wither they were carried yesterday, escorted by numbers of the Macon and other bars."